An Undead Digimon whose muscles have all rotted away. It tried to extend its life by mechanizing its body, but it destabilized its body, and its configuration data has begun to break down. However, because it was given life by those machines, it will not die, and survives with this grotesque appearance. Because its body has broken down, its offensive power and mental capacity are nonexistent, and it acts on instinct. 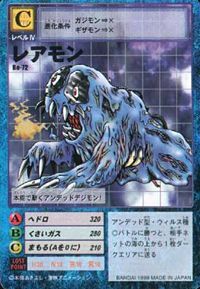 It gives off a foul stench from its entire body, so that Digimon up to the Child-level will simply run away, and will not be its opponent until they grow to the Adult-level. — Digimon Adventure: "Raremon! 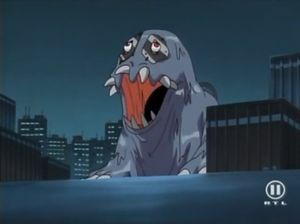 The Surprise Attack on Tokyo Bay"
An Undead Type Digimon, Raremon. It has muscles that have already rotted into mush. Its Special Move is the super smelly Hedoro! — Digimon Frontier: "Wolfmon of Light, The Underground Labyrinth Battle!" | Doro (泥) meaning mud. A Raremon appeared in Tokyo, attacking the bay, searching for the 8th Chosen Child. 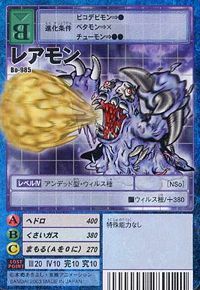 One of the Pagumon evolved into Raremon and fought with Kouji. In Tsurugi's second Net Battle competition, he is challenged by Kondoo and his partner Raremon. Kondoo is the coworker of Saitou, who was angry that a little brat had defeated him with his "Chibi Greymon". Tsurugi seemed worried that Raremon was too strong for him, but in the end he didn't even fight him due to Peckmon's sudden intrusion. Raremon is an obtainable Digimon. 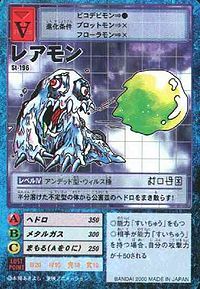 Evolves from Hagurumon (4-5 DP) and can evolve to Vademon (0-4 DP) or Gerbemon (5+ DP). 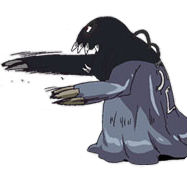 Raremon is a failure evolution, and can be acquired at the Child, Adult, Perfect, and Ultimate levels. 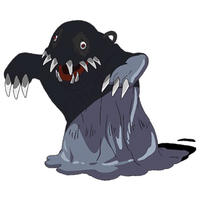 Can be evolved from Otamamon if above level 18 and Machine EXP above 200, or can be found at Sewage Tunnel. He also appears at Junk Factory to give you the Sticky Natto during Gizamon's request mission. Can be evolved from Gizamon if above level 22, defense 90, and Machine EXP 440, or can be found at Angler Tunnel. 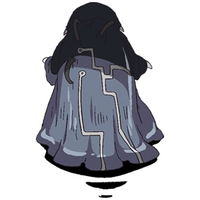 Can evolve to Nanomon if above level 35 and Machine EXP 4400. Evolves from Otamamon or V-mon. Can evolve to Dagomon or Gerbemon. Raremon is an unobtainable boss Digimon. Raremon is available as a Digimon Medal. Evolves from Gazimon or Gizamon when the requirements for the other evolutions are not fulfilled. Can evolve to Ex-Tyranomon. 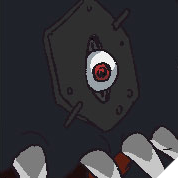 Raremon is an enemy Digimon in Area 01 and 02. Raremon is an enemy Digimon. It throws out polluted sludge from its partially dissolving body! 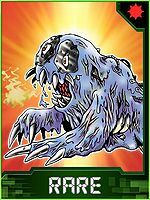 An undead Digimon that moves by instinct! ↑ Digimon Frontier: "Wolfmon of Light, The Underground Labyrinth Battle!" This page was last modified on 14 March 2019, at 19:18.